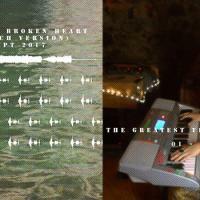 To Heal a Broken Heart ist eine Ambient-Komposition, die auf einem Seed einer Synthesizer-Improvisation basiert, die ursprünglich den Titel 'Some Joke' trug, aufgenommen in London im August 2015. The transmutation from this raw, cynical improvisation, to a few minutes seed later processed to its final result was a meaning bearing process, a search for spiritual knowledge through art. It is a part of a personal journey as a sound artist and composer to learn from the path of harmony in the craft of sound: pursuing deeper, slower experiences, accepting frailty as a basis to all expression and communication between the composer and the listener. Consequently, and in order to address the Ohrenhoch space as a new media for the composition, To Heal A Broken Heart is re-versioned in 2017 as a complete aural experience. It is now reinterpreted as two superimposed tracks: the original 2015 track, filled with harmonics and extended, stretched notes from analogue sources and filters, and an extra track to be played simultaneously in the basement of the gallery. The basement track is the hidden basis of the composition: as its seed constructs a surrounding illusion of sound penetrating nostrils from the left to the right ear, it creates a cycle of 12x1’ seeds linked and faded in and out through the 11’14” of the total composition. The Greatest Thing You’ll Ever Learn is a spatialized sound collage, designed to be heard alternately in both the Ohrenhoch street level space and its basement. It mirrors Sound Activism 2017 concepts: Can art produce knowledge? Spiritual Knowledge / How do we want to live? Soulful presence / Perseverance: As in the zen way. The composition name and seed concept/question is taken from the famous song ‘Nature Boy’ by Eden Ahbez (1948): its tacit answer to the title “is just to love and be loved in return”. The composition is the result of two linked spaces / tracks: a) The ‘living’/learning space: with recordings of piano rehearsals of Nature Boy played by Frick documenting her learning process. These may be raw or tweaked, superimposed or solo, fragments accepting ‘mis’takes and searching for a ‘personal’ version. A testimony of the process of learning and accepting imperfection. b) The ‘ghost’ room/basement: a sound collage –processed and raw- of different historical versions and fragments of Nature Boy by Eden Ahbez, John Coltrane, Nat King Cole among others who have passed away. An ode to the artists who in their continuous learning process gave a different interpretation of a ‘canonical’ song. Both tracks are intertwined together in sound and composition of their harmonic parts, interlacing the ‘living learning’ and the ‘canonic lessons’ from those who lived, learned and loved music as an open journey as well. Gisela Frick – Hassenberg is a sound artist and experimental composer. A few of her solo works are Réquiem para el Camarada Pablo Neruda (2012), Cárcel V'al Paraíso (2013), Slow Motion Graphics (RRS Radio Museo Reina Sofía, 2014), Mirror Forest (Resonancias RTVE / 2016), Raindrop Lullaby (Music Hackspace / Apiary Studios, 2016) and Kindernacht (Ohrenhoch Gallery, 2016) with past collaborations in Tegualda Records (Tegualda Vol III 2012), Ciclo Sonoridades Disociadas, Valparaíso (2014, 2015), Esto lo Puede Hacer Cualquiera (GFR Broadcasting System, 2014-2015), Disquiet Junto Projects (2016, 2017) among others. She is engaged in continuous development and research in sound collage, graphic composition and improvisation. Her focus lies on the paradoxes and harmonies between the abstract and the narrative in sound through processed and raw sources, combining timbres and timing through MIDI and/or analogue. She lives and works in Santiago, Chile.